With good reason, Turks take pride in their traditions of hospitality. And seldom will you meet any one who has visited Turkey from abroad who will not mention the real warmth that Turks can show to visitors. Thus, it is perhaps not surprising that Divan, a Turkish hotel has been awarded a “hotel innovation award” this year. Admittedly, however, it was not the warmth of the hotel’s service, the quality of its rooms, or its fine restaurants that won it this accolade; rather, it was the sanctuary that it provided Turkish protestors fleeing police violence and the excessive use of tear gas this past June. The luxury Divan Hotel, on the edge of Gezi Park, became a refuge for protesters fleeing the violence. 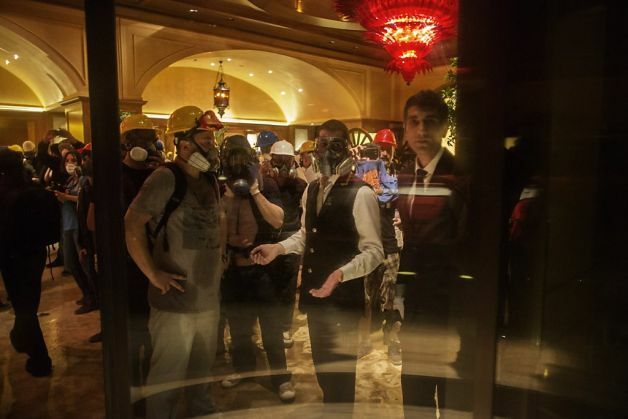 Hundreds of protesters, wearing hard hats and gas masks, filled the lobby, where glass cases of cuff links and silk handkerchiefs were smeared with milk that the injured used to clear their eyes of tear gas. As some kept up their anti-Erdogan chants in the lobby, ambulances arrived and medical workers shuttled in with oxygen tanks and other medical supplies. Audits of Divan’s mother company soon followed, with many suggesting that the investigations were retribution for Divan’s actions during the crisis. It isn’t always easy to be a good host. This entry was posted in Excessive Force, Freedom of Association, Freedom of Expression, Turkey and tagged DirenGezi, Divan, Divan Hotel, Erdogan, Gezi Park, Koc, Prime Minister Erdogan, Taksim. Bookmark the permalink.